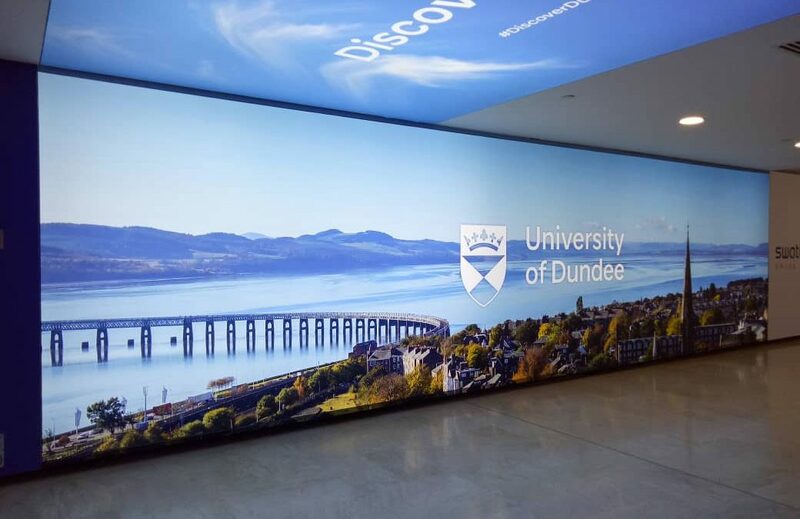 The University has launched an exciting new initiative called Academics Abroad which is a project designed to raise the profile of the University in key geographies by taking high profile, engaging academics from a variety of disciplines to host large-scale multidisciplinary Discover Dundee events. These are aimed at being memorable, high quality, impactful events that will build brand awareness and reputation in these geographies ultimately leading to increased student numbers through both open recruitment and partnerships. The three geographies in this pilot project are India China and ASEAN (Association of South East Asian Nations) which are all priority regions of recruitment and development for the University. This particular two week trip was the first Academics Abroad trip to ASEAN and it included visits to four countries in the region: Indonesia, Singapore, Malaysia and Brunei. Six of the nine University of Dundee schools were represented. The key objectives for the trip were to engage with local British Embassies and governmental departments with education and commercial remits and also with agents, secondary school counsellors, and placement officers to inform them of latest programs and impressive rankings at the University of Dundee. We also met with current and prospective partners to discuss articulation agreements, potential research collaborations, student and staff exchange opportunities etc. and with prospective students and current offer-holders and their parents to encourage applications and to conduct interviews for admission and scholarship awards. Lastly we held alumni events to engage and develop further links with local alumni. Wendy Alexander, Nicole Lombardo, Pam Lawrence and I left Edinburgh on Thursday afternoon laden with souvenirs and shortbread, excited for a very full two weeks engaging with alumni, partners, and students across the ASEAN region. It was a journey with plenty productive of planning on the flights and not quite enough sleep. We arrived in Jakarta and went straight to a dinner meeting with Wendy Alexander. They put on quite the feast for us, It was my first time tasting local Indonesian delicacies including Rendang and durian fruit, everything was delicious. The purpose of the evening was to meet with key individuals that could support us in our mission to raise the profile of the University of Dundee in Indonesia by connecting us with strategically relevant partner Institutions and individuals and to enlighten us as to the current government priorities in terms of Higher Education. It was a great success in this regard. The battle against jet lag began, today I was meeting representatives from the Department for International Trade (DIT) within the British Embassy in Jakarta. It was great to hear more about the fantastic work that they do in country, and we discussed how the University of Dundee’s world-leading academics and research could support the work that they do. We can’t wait to come back to Indonesia to participate in some of the events DIT and the British Council are hosting in February and March 2019. I met a prospective student interested in our joint undergraduate degree program with NUS, and we talked about how he would participate in some of the world-leading research happening within our School of Life Sciences. In the afternoon, Professor Peter McEleavy and I met with some of our agent partners in Jakarta to talk about our new taught postgraduate courses in Life Sciences and developments in our School of Social Sciences. We hosted a dinner on the evening of Saturday 19 January to launch an Alumni Chapter in Indonesia (our 16th). The event was attended by 24 graduates, Vice-Principal (International) Wendy Alexander, colleagues from the Academics Abroad programme and agents. The evening included a welcome address from Wendy Alexander, a talk from high profile alumnus, Dr Parulian Sihotang (Energy Law & Policy, 2003) and the viewing of our ‘memories’ video. Many of the alumni are graduates from our Centre for Energy and Petroleum Mineral Law and Policy (CEPMLP). They told us about their experiences at the University of Dundee and the friendships that they developed and maintained after they came home. They have already set up a WhatsApp group which I have joined, it already had nearly 60 members. It was a great evening and we are very excited to develop the chapter in partnership with our alumni in Jakarta. Woefully unprepared for central Jakarta’s ‘car-free’ Sunday mornings, we had to leave the hotel very early for our flight to Singapore. Although my time in Indonesia was far too short, I am looking forward to my next visit where I can hopefully explore more of the country. We arrived in Singapore in time to host a dinner reception with prospective students and offer-holders. It was so lovely to meet students and their families, answer their questions, and hopefully give them a sense of why we love living and working at the University of Dundee. I had the special pleasure of interviewing applicants and offer holders for School of Life Sciences Global Excellence Scholarships. I can’t wait to meet these impressive students in Dundee in September. At 9am I arrived at the beautiful campus of the National University Singapore for a meeting with our partners in our joint degree programme. We discussed the first cohort of students and applicants to the program and additional opportunities to develop. I then went to Republic Polytechnic, discussed best practice with colleagues in our pathway programme and presented my research to a very engaged group of students, before rushing to the airport for a late-night flight to Kuala Lumpur in Malaysia. As part of the Academics Abroad programme we are keen to showcase the work and research of our academics with our alumni. We invited Dr Salim Mohamed from the School of Science and Engineering to provide a talk as part of our Singapore Alumni event. He spoke about the rapid growth of engineering software in education, research and industry, and discussed some future trends. There was also the opportunity for alumni to network and socialise with each other as well as colleagues from the Schools of Medicine and Dentistry. It was lovely to see old friends and new faces and there is a real appetite for our Singapore group to be ambassadors for the University. Wendy Alexander and I were delighted to be invited to meet with the MARA government educational sponsorship agency to discuss our STEM offerings for the MARA private school students. We then headed to Taylor’s University to meet with the Deputy Vice Chancellor to discuss the launch of our articulation agreements with the School of Life Sciences. We are so excited about these programmes that we are already looking into whether we can expand these agreements to DJCAD and the School of Science and Engineering. Today we went to Kolej MARA Banting to interview offer-holders and applicants to the School of Life Sciences. We were delighted to make offers to seven fantastic students. We invited Professor Niamh Nic Daéid from the Centre for Anatomy and Human Identification to provide a talk as part of our Kuala Lumpur Alumni event. She delivered a short talk titled on ‘The Cutting Edge of Forensic Science’ discussing the use of science in the service of justice. It was very well received with alumni, friends and prospective students coming along to listen to her. Like in Singapore, it was lovely to see old friends as well as new faces. The group are planning to meet shortly to discuss how they can help support the University of Dundee activities in Malaysia. 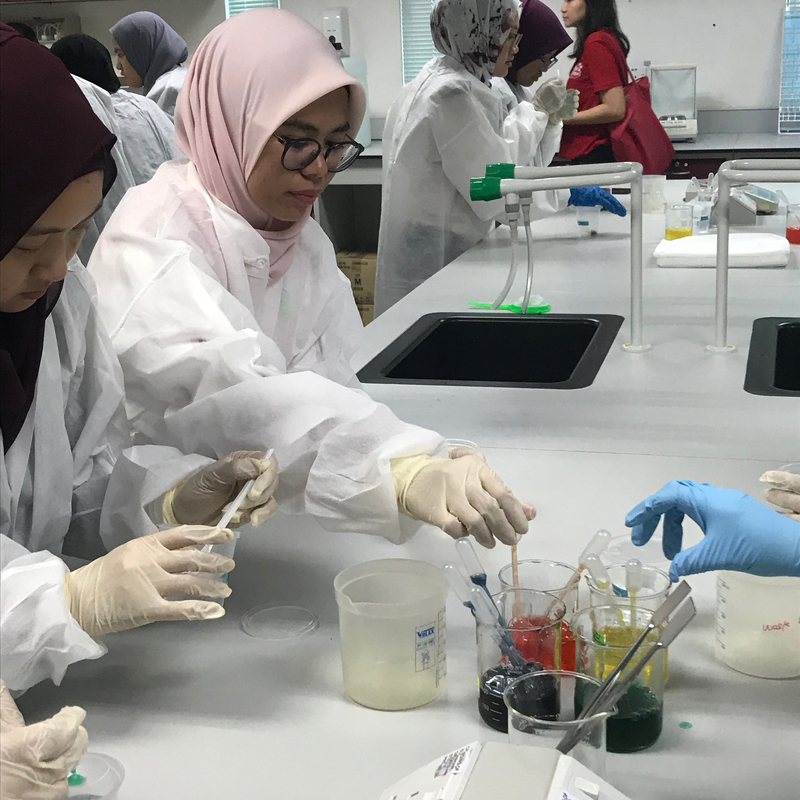 A very early start today for the big event – our 2nd Discover Dundee STEM day at Taylor’s University in Kuala Lumpur. A bus laden with promotional material and staff from across the University of Dundee left the hotel and arrived at Taylors amazing lakeside campus by 8am – we got to work setting up the registrations tables, banners and auditorium. 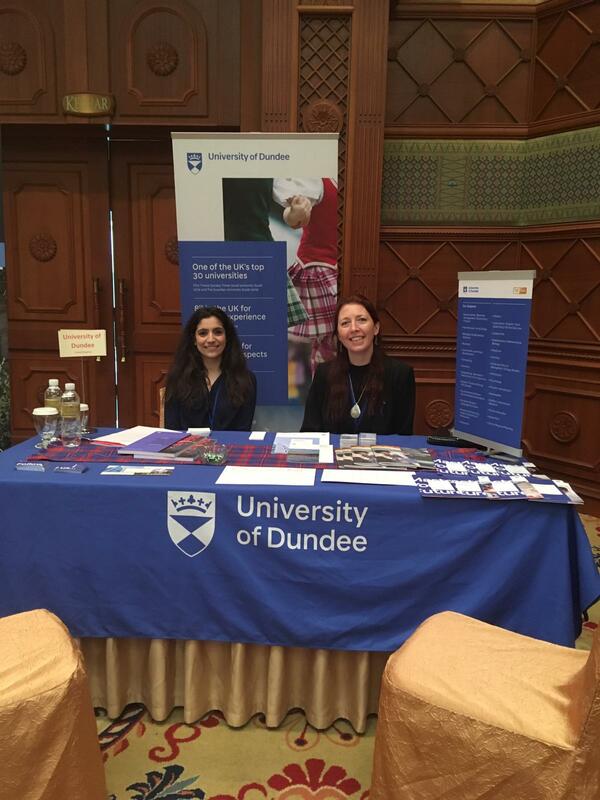 Around 9am the first of the school students started to arrive – we were so pleased that over 200 pupils had registered from seven of the best schools in and around Kuala Lumpur, they all loved their University of Dundee goodie bags and were excited to be there and get started! In the evening we held a Burns-themed reception and dinner at the British High Commission Residence for school counsellors, alumni and agents. There was a welcome speech from the British High Commissioner to Malaysia, her speech was on gastro diplomacy which fitted in well around our Burns theme. Before dinner was served Dr Graham Christie, School of Life Sciences, performed an address to the haggis which was very well received. After dinner there was a woman in STEM panel discussion with female staff from the University of Dundee (Ms Wendy Alexander, Professor Kim Dale, Dr Fiona Stewart and Professor Niamh Nic Daéid). The panel was focussed around those who inspired them in their careers and what challenges they have faced. It was a fitting end to the evening and there were some great questions from the guests. Everyone departed from the dinner feeling very happy with plenty of photos to share with friends and family. Today Wendy Alexander and I met with International Medical University to discuss articulation agreements into the School of Life Sciences. I was lucky enough to get to tour their facilities, before returning to Taylor’s University to discuss an articulation agreement with their Environmental Science Department. I arrived later that afternoon in Sepang for our School Counsellors Conference. A school counsellor (might also be called College Counsellor or University Placement Officer) works typically in international schools and advises the older students on their university and career choices once they finish school, as well as helping them apply to universities all over the world. The purpose of the conference was to build relationships with counsellors from schools across the South East Asia region and to provide counsellors with an intensive and interactive weekend of learning about the University of Dundee. We started the event with a meet and greet reception, and it was so wonderful to get to know some of the counsellors that we would be spending the weekend with. We had a full day of sessions at the conference with 20 counsellors from five different countries. One counsellor from California joined us while she was on her vacation in the region! Staff from across the University delivered sessions and workshops on a variety of topics ranging from admissions and student life at Dundee, to Life Sciences and Art and Design. While I couldn’t possibly comment on all the highlights of the day, for me it was just so wonderful to meet and build upon relationships with so many professionals that are clearly dedicated to their students. Watching some of the presentations, I could see the passion that our staff have for their subjects and and how much passion and dedication they devote to the courses they teach on at Dundee. I hope the counsellors found the day as fun and informative as I did. We travelled to Brunei to attend the Findlay agent fair and meet students and teachers at some of the high achieving schools. We love working with Findlay in Brunei, as they offer unparalleled support for students across admissions, visa applications, and career support. A-level students in Brunei typically get their results in January and many will start University the following Autumn. Many of the students that we met with in Brunei had just received their results and it was wonderful to advise them on their next steps. At the Findlay Study Fair, I met with the Deputy British High Commissioner along with representatives from the Ministry of Education. I also gave a lecture to 15 students on my favourite topic (and my research) – the Notch pathway. 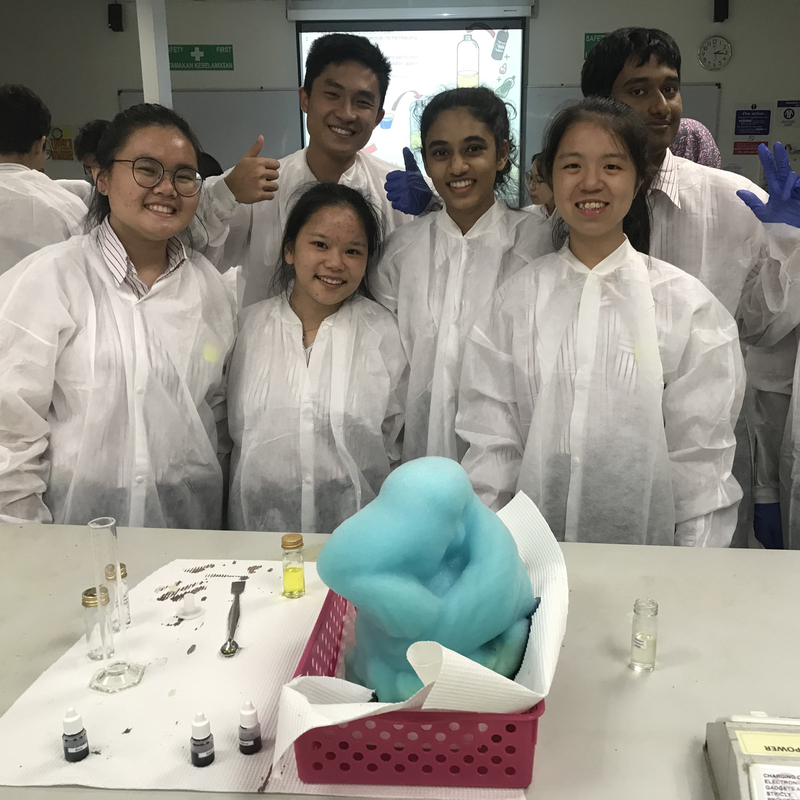 In parallel to the main events of the Academics Abroad trip described here, academics also gave research and recruitment talks at a number of the schools in Singapore and Kuala Lumpur, and academics in the Schools of Medicine and Dentistry conducted interviews for their undergraduate programmes. So all in all it was a hugely action packed and event packed trip which achieved all the aims we hoped it would. 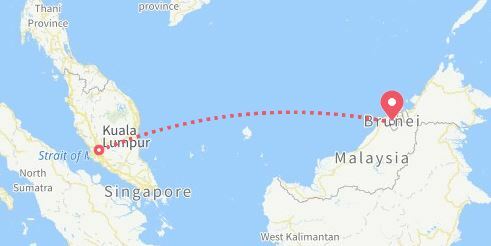 That brings us to the end of our trip with just one last adventure which was a British Airways detour via Kuala Lumpur in order to get home, and to avoid a 24 hour delay in Singapore – thanks to Key Travel for saving the day! We have absolutely loved our time in Southeast Asia and can’t wait to do it all again next year!